Our office is located at the Recycling Center, 3326 Mitchell Road in Bedford. Look for the big yellow sign pictured above! Learn more about our Used Cooking Oil Collection Program HERE! Click Here to find out where garbage goes once you throw it away! 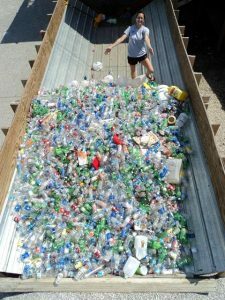 Pictured above is one of our former interns, Emily, with the recyclables from the county fair that we were able to collect and keep out of the landfill. Not only does this help the environment, but it generates income for the district. So, when you’re at the fair, please recycle!